Stomach pain typically results from indigestion or inflammation in the digestive system. If you notice that you develop stomachaches only after eating dried fruit, you may have a mold allergy or sulfite sensitivity. If stomachaches develop anytime you eat foods that contain fruit, you may have another condition, such as fructose intolerance or an allergy to a specific fruit. Only a medical doctor can provide you with a proper diagnosis. 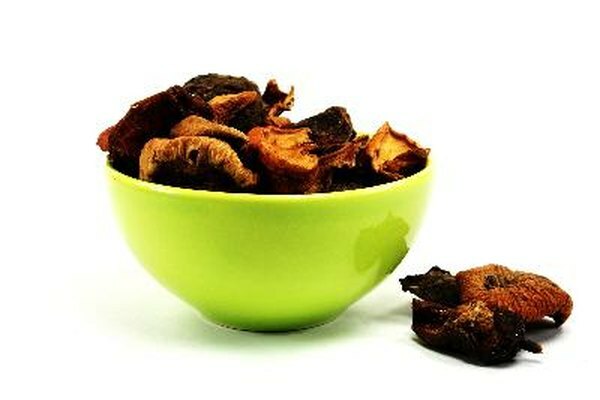 Many dried fruits -- such as dates, figs, prunes and raisins -- contain mold. Although most people with a mold allergy develop symptoms from airborne mold spores, ingesting mold also can trigger an allergic reaction. An allergic reaction to mold on dried fruit can cause inflammation in your stomach and other parts of your body, leading to stomachaches, skin inflammation and asthma. A mold allergy from eating dried fruit is not caused by a digestive complication but rather an overreaction of your immune system; your immune system mistakes the mold as a dangerous substance and attacks it. Sulfites -- chemical compounds that are sulfur-based -- are common in dried fruit, used to enhance the flavor and as a preservative. Sensitivity to sulfites can cause stomachaches just minutes after eating dried fruit. The Cleveland Clinic says one in 100 people are sensitive to sulfites. Sulfite sensitivity can trigger a life-threatening reaction called anaphylaxis, with symptoms that can cause your airways to close, your blood pressure to drop and your heart to race. Most foods that contain sulfites disclose the use of the additive in the ingredients. Consuming a fruit you’re allergic to can cause minor to severe allergic reactions, including stomachache. Common fruits that can trigger an allergic reaction include pineapple, strawberries, tropical fruits and tomatoes. Talk with your doctor about allergy testing to determine the specific foods your body identifies as allergens. If you’re diagnosed with a specific fruit allergy, you will be advised to avoid eating that fruit. Food allergies are incurable, and reactions are preventable only through eliminating the food from your diet. Fructose intolerance is the inability to digest the sugar found in fruit, called fructose. Your intestines fail to produce the appropriate enzyme needed to digest fructose, and the undigested fructose can cause a sudden drop in blood sugar and lead to damage of the liver. You also may have fructose malabsorption, which means you have difficulty digesting fructose. This disorder doesn't result in liver or kidney damage, but it can cause abdominal pain, gas, bloating and diarrhea, says Katherine Zeratsky, a registered dietitian and nutritionist with the Mayo Clinic. MayoClinic.com: Fructose Intolerance - Which Foods Should I Avoid?